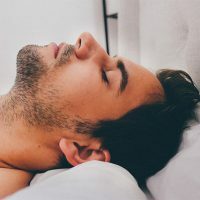 We all know how important sleep is (I hope) but just to emphasise, sleep is essential for our physical health, mental health and for the prevention of chronic diseases. Lack of sleep is linked to an increased risk of a number of serious conditions, such as heart disease, high blood pressure, diabetes and stroke. Without a good sleep we cannot stay healthy. Sleep is essential for our well-being as it helps our body to repair itself, recover and can even “clean” the brain of harmful toxins. I am lucky that I normally sleep quite well at night but there are nights when I am bit restless and wake up often. Sometimes I also have trouble going back to sleep after waking up in the early morning. My fiance is worse, as many times he cannot fall asleep at night (I think it’s the caffeine!) and sometimes he keeps me awake by turning and tossing, not being able to sleep. So when Utmost Me contact me to ask me whether I would like to try their Neuro Rest supplement, I was happy to agree. Neuro Rest is a vegan supplement made with natural ingredients that can help to induce sleep, relieve anxiety and reduce restlessness and tension. 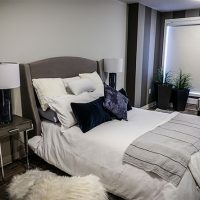 It basically makes people more relaxed so that they can sleep better at night. 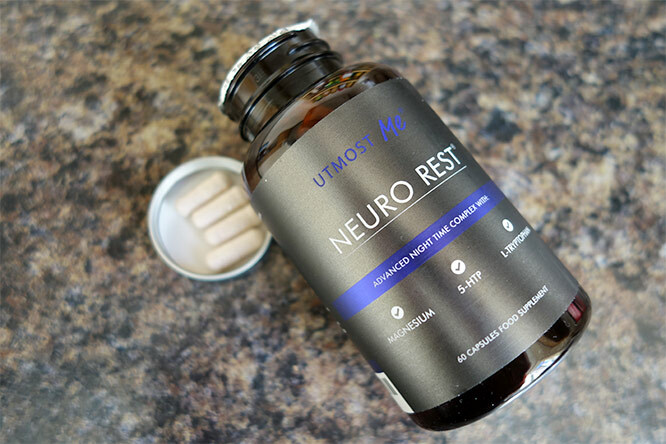 Utmost Me’s Neuro Rest has been developed by doctors, biochemists and expert nutritionists and contains ingredients that have been scientifically proven to work. First of all, before going into a detailed review I wanted to mention all the active ingredients Neuro Rest contains. These ingredients all have properties which have been previously proven to aid sleep. Magnesium is an essential mineral which many of us are deficient in. In fact, magnesium deficiency is very common with about 70% of us having low levels of this essential mineral. Magnesium is vital for many cellular functions, including energy production, protein formation and cellular replication. It’s necessary for hormonal activity and required for muscular function, including heart function. The symptoms of deficiency include muscle cramps, PMS, sugar cravings, fatigue, nervousness and difficulty relaxing muscles. In relation to sleep, magnesium can help you sleep better because it can help your body and brain to relax. 5-Hydroxytryptophan (5-HTP) is an amino acid that our bodies produce naturally. Your body uses it to produce serotonin, a neurotransmitter essential for our mental health that helps to regulate mood, sleep and even aggression. It plays an important role in anxiety, fear and depression. The 5-HTP found in Neuro Rest is naturally derived from the seeds of a plant, Griffonia simplicfolia, which is native to West Africa. L-Tryptophan is an essential amino acid that increases serotonin levels in the body. Serotonin is a precursor to melatonin, a hormone that helps to regulate sleep. Tryptophan is commonly used to treat insomnia and sleep disorders. Melatonin regulates sleep cycles and signals the body that it is time to sleep. Our bodies start to produce melatonin naturally when it gets dark. In the evening, melatonin levels in our bodies slowly increase and we become sleepy. 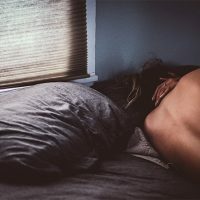 Some people have low levels of melatonin due to stress, lack of exposure to natural light during the day, exposure to light at night (smartphones and computers) and even due to leaky gut. Symptoms of deficiency include feeling awake instead of sleepy after 10pm and finding it hard to get to sleep. Chamomile Powder – Chamomile is well known for its calming properties so no surprise to see chamomile powder in this supplement. L-Taurine – Taurine is a type of amino acid which plays many important roles in the body. It has a sedative effect. All these ingredients are helpful for switching off at night, allowing for better sleep. It’s great to see so many beneficial sleep-inducing ingredients in Neuro Rest but do they really work? In the beginning, when I first started taking Neuro Rest, I haven’t noticed feeling much different. I think that’s because I don’t suffer from insomnia and I am quite healthy in general, normally sleeping quite well. Also worth noting, it’s recommended to start with a low dose of Neuro Rest (1 capsule) which may not have enough effect on certain people. After 4 days you then start to take 2 capsules a night. It’s my understanding that certain ingredients in Neuro Rest may not have the desired effect straight away – if you are deficient in one of the nutrients (certain amino acids and magnesium, for example), it may take some time before you build them up in your body. Once I started taking 2 capsules a night I definitely noticed more changes in my sleep. I would fall asleep quicker than normal and if I woke up during the night or in the early morning, I would go back to sleep much easier than before. The supplement was definitely doing something. No doubt it made me more sleepy and more relaxed and as a result, I’ve been getting better quality sleep lately and have spent less time being awake after waking up at night or in the early morning. My fiance has been testing this supplement as well and he is nothing like me when it comes to sleep. He often cannot sleep at night and he is very restless with lots of thoughts going through his mind all the time. He doesn’t find it easy to switch off. But since he’s been taking Neuro Rest, this is really helping. He tells me he just passes out at night in bed. And we have fewer nights when his sleeplessness is affecting my sleep (when he tosses and turns). I’ve had a positive experience with Neuro Rest from Utmost Me and I highly recommend it to those who are struggling with their sleep. This supplement definitely works so it’s worth giving it a try. Just keep in mind that you should take it for a few days or more before you start to see some real results. And remember to consult your doctor first if you suffer from any health condition. Neuro Rest is available at Utmost Me and costs £24 for one bottle (get 3 bottles and save 25%). You can also buy this supplement on Amazon (click to check the current price). This is a collaborative post which contains affiliate links. I may get a small commission when you purchase a product after clicking on a link. This does not affect its price. How much deep sleep should you be getting every night? Your fiance sounds a lot like me when it comes to sleep – I may have to give these a try and see if they help me. I think Neuro Rest sounds great. I have a few friends who suffer from insomnia so I will tell them about it. Vegan products that are suitable for vegetarians and are environmentally friendly are always my preference. Neuro rest is something I could use as I am always finding it hard to fall a sleep. I will definitely check this out.